30 Boredom Busters When You’re Ballin’ on a Budget | Finding delight. Summertime is awesome, but the long days can really start to feel loooong. Especially if you’re on a budget. I get it. You wanna be spending savvy…and vacations, barbecues, weddings, and outdoor activities — basically all the hallmarks of the season — add up fast. But I’m here to tell you, saving doesn’t have to be a jail sentence. You don’t have to spend your summer cooped up indoors with only a Netflix queue and a never-ending march of PB&J’s to get you through to September. NO SIR! * Take a hike. Hop online and find a trail near you. Tons of parks have lovely, ambling paths if you don’t live near any forests or mountain ranges. * Go to the movies. Theaters often offer more affordable matinee prices. Or you could scope out a summer film series to catch a classic or to watch a family friendly film in the great outdoors. * Drink at happy hour. Nothing says affordable (responsible) fun like 2-for-1 margaritas and home by 9pm. * Play a game. Invite friends over and play your favorites. I love rummikub and the card game 13. Scattergories and Balderdash are always a good time…but I’ve found trivia games sometimes end in fights, lol. * Hit up a museum. Scope your area for museums and then check out whether they offer free/reduced admission on certain days. * Pamper your pet. Devote an afternoon to your fur baby! Take your dogs to a local dog park or give them a luxurious grooming session. Brush your kitty’s fur or take them on a leash to explore the yard. * Host a potluck dinner. Everyone brings a dish to enjoy. Set a theme or let everyone go rogue and see what happens! * Practice yoga. Head to YouTube for a ton of free classes or just unroll your mat and salute the sun. * Watch TV the old fashioned way. That is, avoid the binge. Pick a show you want to watch (like this one or this one) and resolve to watch one episode a week on a set day and time. * Read at a coffee shop. Leave your phone and laptop at home! * Support local arts. Tickets to a live performance (think: local theater, picnic with the pops, dance recital) won’t break the piggy bank. However, if you’re really counting coin, you can usually watch dress rehearsals for free if you know the right people. * Shop the thrift stores. Wandering around a thrift store without buying anything at all can kill an afternoon of boredom. But if you wanna spend, set a limit (and only bring that much cash along) or keep a list of items you’re on the hunt for and what you’d be willing to spend on each item. * Donate your time. Volunteer for a cause or organization that speaks to your heart. * Make DIY home decor. Spruce up your surroundings with homemade craft projects. Bonus points if you use materials you already have on hand! * Take a sunset walk. Or a sunrise walk if you’re an early-bird. * Try out gyms. Shop the work-out spots in your area by enrolling for free trials wherever strikes your fancy. Make sure there are no strings attached! Go as often as possible during the trial period (and then cancel if it’s not to your liking or in your budget). * Hunt for treasures. Keep your eye on the side of the road for trash-to-treasure possibilities. Pulling over now could turn into a weekend up-cycle project later. * Stop and enjoy outdoor art. Statues, fountains, landscaping, and murals exist for the enjoyment of ALL! * Learn the constellations. Study up and then head out to observe the night sky (or a planetarium if you’re stuck somewhere with lots of light pollution). * Pack a picnic. Dining al fresco is always fun! Here are a few food ideas and you can never go wrong with a bottle of rosé. * Play video games. Purchase a new-to-you game (there are lots of places to buy second-hand and many libraries even have game lending!) or opt for a forgotten favorite classic. Don’t have a gaming system? The arcade is a budget-friendly outing! * Resurrect a childhood past-time. Were you a pro at skipping rope? Puzzle queen? Soccer all-star? Did you build legos with the best of ’em? See if your forgotten hobby still tickles your fancy. * Clear out your closet. Nothing is more satisfying than bringing a big ol’ garbage bag of clothes to the Goodwill. Even better? Bringing a big ol’ garbage bag of clothes to a clothing swap with your pals and getting to go home with trades. * Take pictures. Explore a new neighborhood, park, or town with your camera in tow. * Perfect a copycat recipe. Do you have a favorite restaurant dish or coffee shop beverage? Do a little internet sleuthing, buy the ingredients, and practice hacking it! * House swap. Coordinate with friends or family member to facilitate super affordable (read: free) housing for a weekend get-away or vacay. * Go on a bike ride. Blasting the Now and Then soundtrack while riding is optional but recommended. * Make dessert and eat it first. Because, why not? Over to you! How do you bust boredom when you’re on a budget? 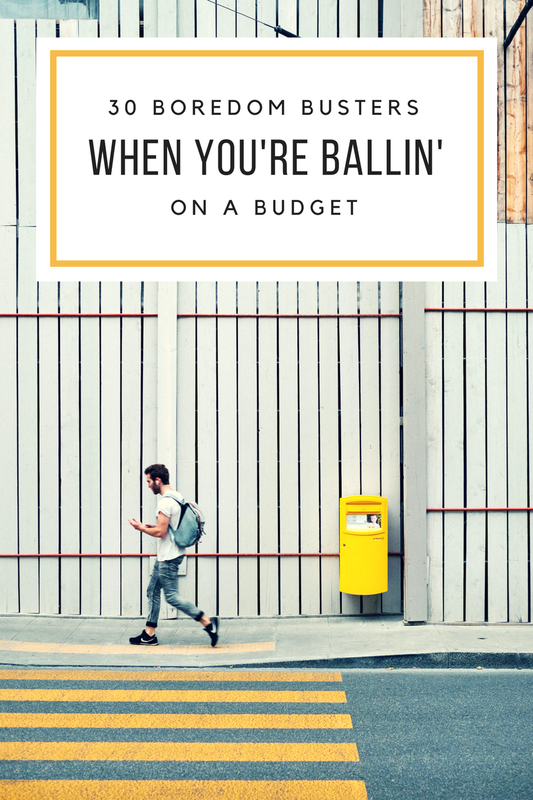 For more ballin’ on a budget tips and tricks, CLICK HERE! Nice list! Funny enough, I do several of these regularly!